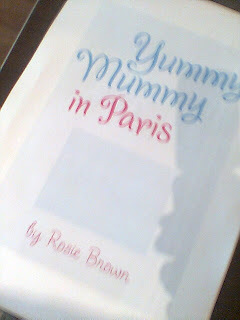 The website of chick lit author and writing mother Rosie Brown, author of the novel "Nearly Yummy Mummy in Paris"
Discuss "Nearly Yummy Mummy in Paris" with the author! I'm currently touring book clubs in England and France to discuss the book - so if you'd like me to come to yours, contact me via the contact box below! If you're in Paris, make sure you come to the launch TONIGHT at Brentano's bookstore, 37 Avenue de l'Opéra, 75002 Paris, from 7.30 - 9.00 pm. There'll be a reading from the book, plenty of wine and canapés, and the chance to get your personally signed copy for Christmas! Plus the chance of winning a E200 gift voucher to spend at the fabulous, 5* George V hotel! 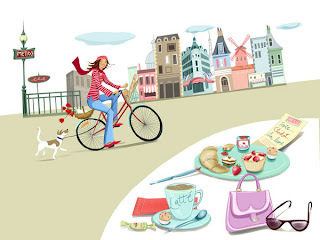 "Nearly Yummy Mummy in Paris" is published! I agree with JK Rowling on one point: cafés really ARE the best place to write books. And you'd think, living in Paris, that would be easy, wouldn't you? 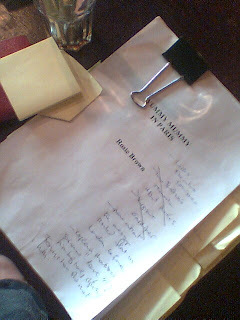 After all, Paris must be full of cafés just waiting to welcome the budding writer....Wrong. The average Parisian café has a row of unfriendly men propping up the bar and no place to plug anything in, not to mention a scowling waiter. So I was about to give up and opt for the madness at home, when I discovered...of all places, STARBUCKS. I kid you not. Where else can you buy one capuccino, plug in, and spend the whole day tucked happily into a corner, typing away with nobody to bother you? 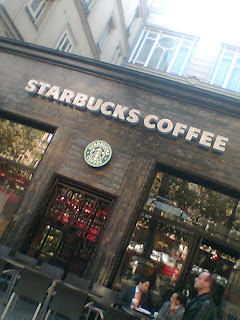 And Starbucks on Boulevard des Capucines (pictured) has a ceiling covered with gilded angels which would put Versailles to shame. So, ta da....this is where NYMP was written! Lucky me to land a star illustrator! I can't believe my luck that Lucy Truman was asked to do the cover design for NYMP. She's a real star, and is at the cutting edge illustration company New Division. 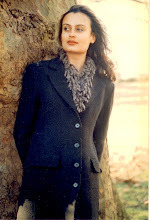 Just look at this example of her work!